The Institute for Veterans and Military Families (IVMF) at Syracuse University is a key contributor in the support of Veteran entrepreneurs and research on transitioning Veterans. In the past, we have spoken with IVMF’s Director, Mike Haynie, and their Manager for Managing Director for Programs and Services, Jim McDonough. This week, we talk with Nicholas Armstrong, IVMF’s Senior Director for Research and Policy. 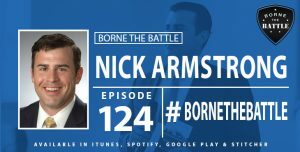 The post #BorneTheBattle 124: Nick Armstrong – Army Veteran, Senior Director of Research and Policy at IVMF appeared first on VAntage Point.